If Bryan could be any superhero, he’d be Batman. Or Black Panther. They’re smart, they think 10 steps ahead, and they’re tough. Bryan’s dad and his older sister, Ava, both say he should be tough: “don’t be soft” they tell him, but his mom keeps him cool and level-headed. She also introduces him to Mike, who is in 7th grade – one year older than him in school – and Bryan thinks he’s pretty tight. Mike loves comics and drawing superheroes just like Bryan, and he doesn’t let school get in the way of having fun. Slowly, Mike starts asking Bryan to take more and more risks: climbing up to the rooftop of a neighborhood building, ducking the subway turnstiles to take the train for free, skipping school to get the newest Luke Cage comic. Bryan doesn’t feel so good about lying to his parents, especially his mom, but he loves the feeling of freedom that comes with hanging out with Mike. Bryan’s internal struggle to make the right choices is grounded in Tight’s contemporary Brooklyn setting and in his genuine interactions with strong secondary characters. He genuinely wants to do the right thing, while also wanting to give his friend a chance to choose better as well. Maldonado’s dialogues present a variety of perspectives on peer pressure and the difficulties of navigating friendships as a young person, making it easy to empathize with Bryan. In the spirit of Halloween, we’d like to share two new picture books with characters who rethink their requests for scary stories. Little Monster is confident he wants to be in a scary story, until he’s stuck in the middle of one. Witches, ghosts, and spooky houses? “Golly Gosh!” and “Jeepers Creepers!” he says. Little Monster doesn’t want to be scared; he wants to do the scaring! The narrator (indicated on the page with black text, where Little Monster’s words are purple) acquiesces, putting Little Monster in charge of the upcoming frights. Is Little Monster ready to scare? With charming dialogue and just enough forewarning for what the next page holds, I Want to Be in a Scary Story will delight any child who wants to be in a story – on their own terms. Parents who’ve struggled to satisfy competing requests will recognize Papa’s burden in The Too-Scary Story. Grace and Walter settle in for a bedtime story, but they can’t agree on how scary it should be. The dark forest setting is “too scary” for Walter, so Papa introduces the “twinkling lights” of fireflies. But that’s not scary enough for Grace! Back and forth the story goes, scary to safe, until Walter and Grace agree – the story is too scary! Luckily, Grace has her magic wand, and Papa is never too far away to bring the story back to safety. Murguia’s mixed media illustrations follow the alternating moods of the text and complete this bedtime adventure. Posted in 1-2, Candlewick, courage, Pre-K, Scholastic, Uncategorized. This is one of the most remarkably affecting books I have ever read. When a baby is born, he or she doesn’t know s/he is deaf, autistic, or any different from anyone else; it is positively heartbreaking to read about this one’s introduction to a world that was almost unfailingly cruel. Born in in 1899 in rural Idaho, James Castle was deaf, unable to speak, and autistic. Through straightforward narration, his nephew attempts to show the world through baby James’ eyes: “James opened his eyes to the world and saw things that moved and things that were still. Anything that moved seemed to scare him. He cried as his parents bobbed around him with darting eyes and flapping mouths. But James couldn’t hear himself shrieking. For him the world would always be silent.” It is truly the stuff of nightmares, interpreted hauntingly by Say’s mixed-media art, some in smudgy grayscale and some in color. Images of young James engaged by various scraps of paper, charcoal, and other “found” art materials are almost peaceful; they are juxtaposed by harrowing scenes of him holding his arms around his ears while other children scream taunts at him. James’ own parents were no doubt as terrified and perplexed by their son as he was by the world; unfortunately, they were ill-equipped, or unable or unwilling, to figure out how best to rear him. At first, they gave him old paper or other throwaway items, since those things seemed to keep him entertained or at least occupied. They sent him to a school where he appears to have found some level of engagement: looking books and printed materials in the library, although he could not read; watching teachers sew books together; and doing “well in shoe repair class.” But the school considered him a failure because he could not learn to speak. There is no judgement made explicit in the text on the principal who advised James’ parents “…not to give James and drawing materials at home. He said James should learn to read and write and not waste time on drawings.” Readers will come to their own conclusions about the humanity, or lack thereof, in this approach. As an adult, James became extremely isolated, essentially living in a barn where he had his “studio” and a mattress on the floor. Continually tormented by kids stealing his artwork, and called names such as “Dummy” and “Crazy Jimmy,” he nonetheless persisted in doing the only thing that seemed to give him any pleasure: using whatever he could find (soot with spit, charred sticks, and the like) to create art. Say’s portrayal of the type of illustrations James was creating at this time show eerie pictures of people with boxes or blank circles where faces should be, as well as quotidian images of small wooden houses and little puppets of dolls, farm animals and birds. We’ll never really know, but it’s possible James was expressing his wishes, desires, and silent dreams for home and companionship in the only way he knew how. An author’s note, bibliography, and photos of some of the found materials Say used to create the art round out this haunting picture book biography for older readers. Posted in 3-4, 5-6, 7-8, courage, empathy, Scholastic. Opening the pages of one of Doug TenNapel’s book is a bit like pressing play for a David Lynch film: you feel the certainty in your gut that it’s going to be a surprising and unique experience, an hour or two of bizarre, sometimes even disturbing images you’ll never forget seeing. The difference is, with Lynch’s work, I’d usually prefer to look away; with TenNapel, I can’t tear my eyes from the page. 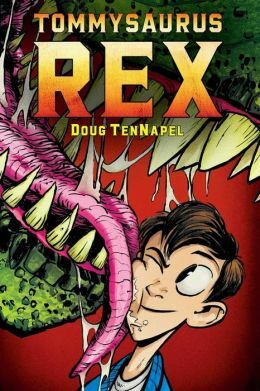 Before the warped worlds of Bad Island and Ghostopolis, before the philosophical minefield of Cardboard, Doug TenNapel wrote Tommysaurus Rex, now beautifully republished in full color (contributed by Katherine Garner). In this middle grade graphic novel, a boy named Ely loses a pet dog and gains a pet dinosaur. Ely knows in his heart that the tyrannosaurus – playful, good-natured, and in need of training – is some manifestation of his old dog Tommy, despite its also having memories of Cretaceous life (and death). The mechanisms for the dinosaur’s rebirth and reincarnation are largely unstated, and blissfully so; TenNapel’s masterful storytelling presents a confident, fantastical logic that shrugs off the dull necessities of reality. The reader is happy to shrug them off, too. In Tommysaurus Rex, TenNapel nods to fellow monster creators: Ray Harryhausen, visual effects artist who innovated new stop-motion animation techniques in the 1950s and ‘60s, makes a cameo appearance in Ely’s story. Bill Watterson was a clear influence on the artist; like Calvin and Hobbes, Ely and his fellow humans are drawn with occasionally zany stylistic expressions, while Tommysaurus is almost frighteningly realistic. Yet despite its allusions and tributes, the style and story stand alone. Calvin and Hobbes cuts with wit and cynicism, but through its perfectly messy imagery and fantastical conceit, Tommysaurus Rex rings loudly and truly with heart. One moment you might recoil from the image of a tyrannosaurus digging into a bloody feast of a cow carcass; the next, you’re holding back tears as a bully expresses regret or a friend says good-bye forever. TenNapel always surprises me somehow, except I always know I need to hold on for dear life (and keep the tissues within reach).